Classic Adventure in the Void! 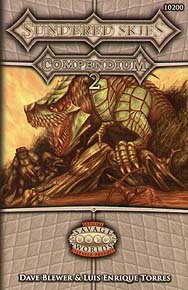 Sundered Skies: Compendium 2 contains the Songs of Remorse mini-campaign plus a bonus adventure! A shattered world. A thousand floating islands. A constant glow of madness. Sundered Skies begins where every other world ends. A Little Knowledge... Can Be A Dangerous thing! What starts off as a routine courier job delivering a message to a hermit in the Shattered City turns into a desperate race against a powerful member of the Bright Cabal with the ability to tear memories from its victim's minds. The recently discovered isle of Savannah is a jungle isle inhabited by dinosaurs and strangely devolved savage drakin. The heroes find themselves in a deadly race to reach a hidden temple deep in the jungle. The heroes become aware of an age old prophecy which seems to be describing them. Not everyone wishes this prophecy to be fulfilled however, and soon they are dodging attempts upon their lives as they race to discover what it all means. Four Perilous Ruins... Dozens Of Ways To Die! In the Sundered Skies salvage is literally more valuable than gold, a wooden chest is much more prized than the bullion which fills it. Scavengers are adventurers who risk life, limb and sanity to find the best salvage, and the best salvage is found in the deadliest of ruins. Sundered Skies from Triple Ace Games, is a dark fantasy setting for the award-winning Savage Worlds RPG.